Tag Archives for " Google Keyword Planner "
I talk about content, well, all of the time. I know many of you are sick of reading about it, but I don’t think it’s going away anytime soon. In fact, high-quality content that addresses the needs, concerns and questions of your ideal clients is pretty much the price of admission these days. It’s not enough to create and optimize web pages and call that content either. You must commit to producing content much like a publisher of a magazine and you must do it strategically. Waking up on Monday and deciding what to write about on your blog is not a content strategy. Content is such an essential element in the marketing puzzle you must plan your content like you might your promotional calendar or budget for the year. Taking a strategic view of content means you must understand the body of work you need to create over time to turn your content efforts into an asset that will serve your business long-term. In my view, this means applying the same kind of keyword, competitive and linking research that most associate with SEO to your editorial approach. And that’s the point really – in order for your content to pay dividends it must help drive traffic, shares, influence and conversion. The first step is to start making a list of your most important themes. I generally try to find three core themes and about nine supplemental themes. (Nice tidy 12 monthly themes.) Your core themes are the kinds of things that might be found on your homepage or even in the title attribute of your home page. Or, perhaps the main navigational elements of your site. Your supplemental themes round out the list and while not as important, certainly make fodder for your ongoing blogging efforts. Now take that list to the Google Keyword Planner and see if you can find themes that have significant volume. You must balance key terms with being too generic though. A term like “marketing” wouldn’t make sense as a theme, even for a marketing consultant, but a term like “referral marketing tactics” might. From this work, you should have developed a pretty solid dozen or so candidates for your monthly themes. I also like to take the terms to the Google search page and see what they suggest as related searches and who shows up on page one for these terms now. Now that I have my terms I want to get more specific ideas for actual topics I might map to each month. For this task, I lean pretty heavily on a tool called BuzzSumo. 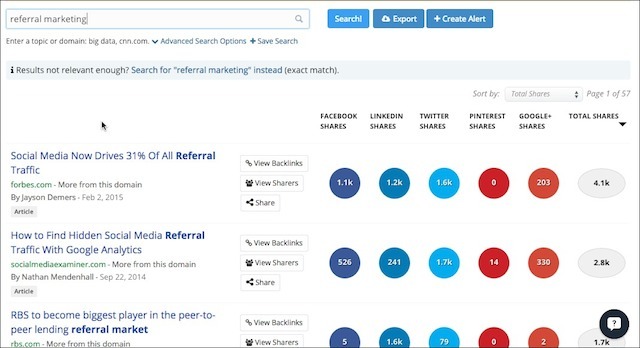 There are other tools that can be useful, such as Topsy, but BuzzSumo does so many things I find myself sticking to it. I use it to uncover actual highly shared blog posts around each of my themes so I can get some solid ideas for my own content and see what types of things get shared the most by others. You do have to use a little creativity here – for example a plumber that does bathroom plumbing might also search some common problems related to bathroom plumbing to find good ideas. I might also employ a site like Quora to see the kinds of questions people are asking about my themes. Answering questions is always a good idea for a blog post. Now that I have a good start to the actual topics related to my themes, I want to start figuring out who else writes about my themes, who else like to share this kind of content and what sites are seen as influential in the space. Again, BuzzSumo is a pretty great power tool. With the higher paid plans, you can discover a list of influential bloggers related to the topics you are interested in. I generally follow and list these folks on Twitter and even subscribe to some of their blogs in Feedly so I can start sharing their content. Eventually, I may try to develop the kind of relationship where I could ask one or more of these folks if I could submit guest content or if they would like to do so for my site. You can also narrow your topic search to include only guest posts. It’s pretty good bet that a person likes to write guest posts or a site likes to take guest posts if they show up on this search. This is indeed a way to get more content to fill your plan but it’s also the strategic part of building links to your site and gaining exposure for your content outside of your own efforts. You know you need content, so stop fighting it and start making a plan that allows you to better delegate, build and amplify your content asset. When the marriage of Content + SEO + Social became official back in about 2009 (although some states still don’t recognize it) the act of keyword research became a vastly different animal. While SEO pros still use keyword research today as a means of identifying terms and phrases to use to optimize pages on a website, the act of keyword research implies so much more in the modern marketing world. Optimize existing content – relying heavily on the Google Keyword Planner tool and the paid ad sets function in particular I try to determine key foundational phrases to build our entire online presence around. Obviously this is work is informed by our marketing strategy and some understanding of who we are trying attract and what we want them to do. Conduct on page optimization – Again, relying pretty heavily on data from the Google Keyword Planner and competitive research using tools like MOZ, keyword research is used to work on under the hood things like title tags, alt image attributes and page descriptions. Spot opportunities for new content – Most of the folks I’ve worked with over the years don’t have nearly enough content or in some cases any content focused on some of the most important and most profitable aspects of their business. I use keyword research to help build a content strategy. 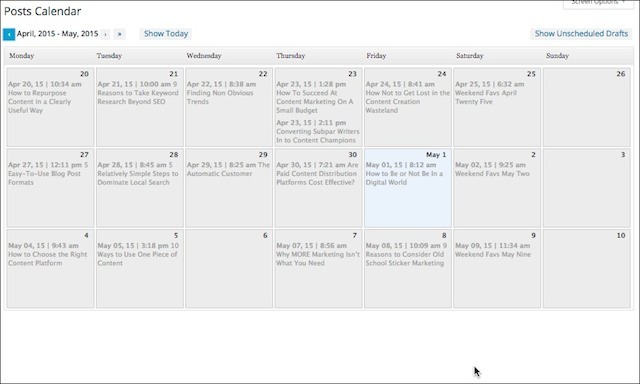 Create content themes – I’ve long promoted the use of an editorial calendar as a tool to help properly build out your content and publishing routine. After brainstorming with a client’s team, I turn to keyword research to start building editorial themes. I then take my proposed theme list to BuzzSumo and start looking for the most shared content around these themes. I might also create content alerts for my themes in BuzzSumo so I can start passively monitoring when my themes are written about. Build influencer lists – Once I know what my themes are going to be for the year I know that I want to start building lists of individuals who can support those themes. I believe that building industry influencer lists based on content and keyword themes allows you to create a more focused list than one that relies simply on large followings as a metric. My go-to tools for this step are BuzzSumo and Inkybee. I might also employ the MOZ Followerwonk tool to help segment Twitter lists and followers. Build journalist lists – Just like the step above I always want to use my keyword themes to help identify a small list of journalists that might be influential in spreading the word. Once I create the list I generally create a Twitter list and employ BuzzSumo alerts to get notification when one of my journalists puts something out. I might also employ a tool like Toucan that sends me alerts when any journalist puts a query out matching my keyword phrases. Build blog lists – Often times the best way to learn about an industry or keep tabs on what my clients, competitors, influencers and journalists are doing on a day to day basis is to create lists of blogs for each and add my keyword research to help identify new voices writing about my terms. I use BuzzSumo and Inkybee to help turn up these new blogs and then employ Feedly to easily group and scan these blogs. Build guest lists – Another tactic that bubbles to the surface during this expanded view of keyword research is that of building lists of potential guest bloggers and potential blogs where I might try to place my content. Again, my key themes are at play here once you have a good idea of your themes you can start to unearth people who like to write guest posts and places that accept guest posts. One trick is to simply use your keyword phrases with the added term “guest post” into BuzzSumo or Topsy and see what turns up. Build link lists – I’ll end up with a core SEO tactic that I believe is so much better informed by keyword research coupled with many of the elements above. Using tools like the MOZ Open Site Explorer you can easily build a list of backlinks to your competitors, but by thinking in terms of content themes and all of the list building and networking involved in previous steps you start to build a much more organic and potentially more useful list of backlink opportunities.